When it comes to ownership of property, Hong Kong law does not differentiate between residents and non-residents, or between nationalities. Similarly in terms of inheritance, there is no restriction on the persons to whom property may devolve on death, provided they are 18 or over. Where there is a valid will, the estate will be dealt with according to that will. In the case of intestacy, Hong Kong law will apply to immovable property situated in Hong Kong, whereas for moveable property the court will look to the law of the domicile of the deceased. The court will require evidence of that law, normally by an affidavit of law given by a qualified practitioner in the relevant jurisdiction. Domicile under Hong Kong law is a complex issue. It is not the same as residence but is acquired at birth and can be changed only by adopting some other place as one’s long term home. An application for grant of probate is made by way of filing an affidavit in the prescribed form with the Probate Registry. Usual supporting documents required are death, marriage and birth certificates. If any of these are issued by foreign governments they need to be authenticated. Where the foreign country is a signatory to the Hague Convention, a Certificate of Apostille from the proper authority there certifying the signatures and/or seal of the issuing authority are required. or a grant of administration in respect of an intestate estate – will be necessary. Limited arrangements exist for the Hong Kong court to re-seal grants issued in other jurisdictions where they also cover Hong Kong assets. In this manner a fresh application for probate is avoided. This is presently restricted to grants issued in Tasmania, Victoria and South Australia and the Northern Territory of Australia, New Zealand, Singapore, Sri Lanka and the United Kingdom. In other cases it will be necessary to apply for an original grant in Hong Kong. The Probate Registry is often criticised for delays in the application process. In simple cases a year is not uncommon, and more complicated cases (particularly involving persons who die domiciled overseas) can take very much longer. For this reason, subject to individual tax considerations, it may be sensible to acquire Hong Kong real property through an offshore corporate vehicle (the shares of which are likely to be subject to probate in their own jurisdiction), or to consider placing substantial assets in a trust. However, professional advice should be taken on this and Zetland will be glad to assist. Where under the domestic law of the deceased there is any form of “forced heirship”, the Hong Kong courts may, under arrangements for reciprocal enforcement of judgments, enforce an order made in that jurisdiction relating to the division of the estate, as far as it affects assets situated in Hong Kong. Whoever obtains such a foreign judgement would have to try and persuade the Hong Kong court to enforce it. Although it is not certain that the court would do so, it remains a technical possibility. If forced heirship issues may be relevant a suitable trust structure may be considered. Zetland will be able to assist in this regard. A will is very desirable for a number of reasons. Foremost amongst these is to avoid the application of the statutory rules which govern the devolution of an estate in the absence of a will. These frequently do not coincide with the intentions of the individual concerned. It is advisable for a lawyer to be instructed to draw up the will. Execution must observe certain formalities. The will must be signed by the testator in the presence of two independent witnesses (i.e. 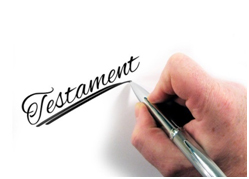 persons who do not stand to benefit under the will), who must then sign the will as witnesses in the presence of the testator and of each other. Anyone of 18 or over can act as a witness, and they do not need to be resident in Hong Kong. The will can be executed out of Hong Kong. It is not entirely necessary that a separate will be made under Hong Kong law in respect of Hong Kong property. A will validly made under the laws of another country in which, either when it was executed or at his death, the individual was domiciled, habitually resident, or of which he was a national, will be treated as valid in Hong Kong. However the will should be in English if further complication is to be avoided. Nevertheless a separate Hong Kong will is generally advisable and is likely to speed the probate process. It can deal with property in other jurisdictions where appropriate. In the absence of any specific contractual restraints or conditions of grant affecting a property, the owner of property in Hong Kong is free to dispose of it in whatever manner he sees fit, either during his lifetime or by will. There is no form of Hong Kong inheritance or gifts tax in respect of property situated in Hong Kong. If there are no surviving children, parent or siblings, the entire estate (after payment of debts and expenses) will devolve on that spouse. If there are children the spouse will be entitled to a legacy of HK$500,000 and to half of the remainder of the estate absolutely, with the balance passing to the children once they reach the age of 18. If there are no children but there are parents or siblings living, then the spouse’s legacy increases to HK$1 million before the estate is divided as to half to the spouse and the balance equally between such surviving parents or (if none) siblings. If there is no surviving spouse, then the estate will pass through different levels of relationship, with the members of the highest level taking the entire benefit equally between them. These levels start with the children, and pass through parents, siblings, aunts and uncles and so on. Ultimately, if there is no one who qualifies, then the assets pass to the Hong Kong Government. Where the deceased died domiciled outside Hong Kong, and the whole of the estate in Hong Kong consists of immovable property, a grant limited to that property may be made in accordance with Hong Kong law (i.e. the intestacy rules), and the priority in which persons are entitled to apply for a grant of administration follows a very similar order to the priority for distributions. For more information please feel free to contact Mr. Francis Chew at francisc@zetland.biz.